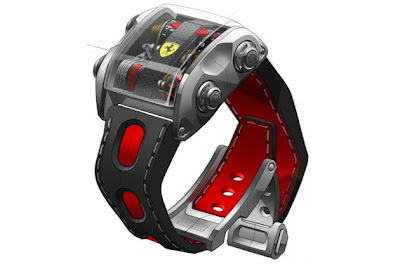 GCCMOTORS Blog: New Ferrari watch for Ferrari owners "Only"
This watch is limited to 60 examples only, available only to existing Ferrari owners at a price point of – wait for it – $300,000, around 90,000 KD. The watch is designed by Jean-Francois Ruchonnet. Its time to leave your Panerai and get this one. this watch is more expensive than the new ferrari california.. redicilous! the panerai limited ferrari edition watch were sold for a fraction of that.. and design-wise much better looking than this one!